Created by the extremely talented 15 year old Sam Kellman, the Opechee Haunt has embarked on its first year away from haunted mazes. This year, the Glendale yard attraction is a family friendly play entitled Jack’s Halloween Jamboree. 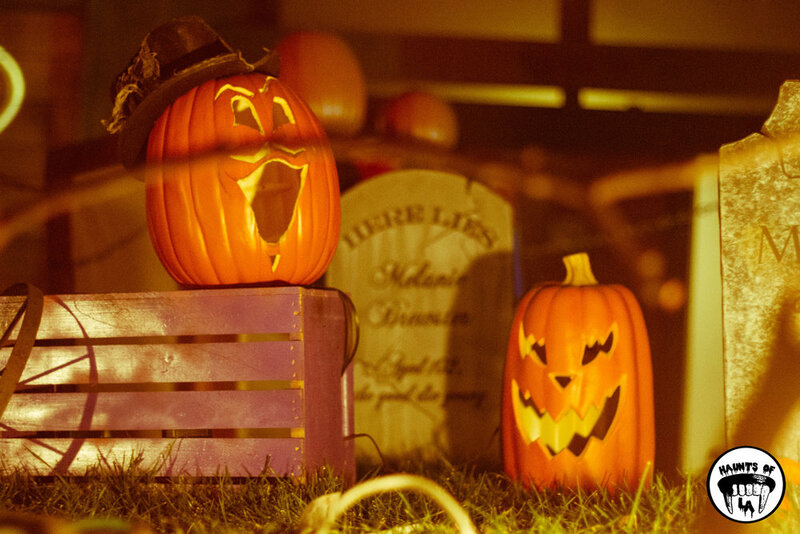 The show takes place in Kellman’s front yard - which has been transformed into a cemetery filled with animated jack o’ lanterns. The personalities in this play provide a fun variety show enhanced by the technical prowess exhibited in the sound and lighting. Kellman’s talent permeates the play through the sequenced projections and lights which are synched to the symphonic audio. The multiple stereo points throughout the yard create a great illusion as the audio seems to emanate out of the mouths of the characters. The script is well timed and playful as it incorporates pop culture, comedy, and music into a very entertaining attraction. Jack’s Halloween Jamboree is very enjoyable and offers a hybrid of old world Halloween mixed with modern technology. A creative and original idea like this is rare. The influence of Disney, Universal and even Boney Island are present while the dialogue is whimsical and reminiscent of vintage Halloween skits and Peanuts cartoons. Hellman's creativity is already decades beyond his age. We have no doubt that he is on his way to create great works of art that the world will love. 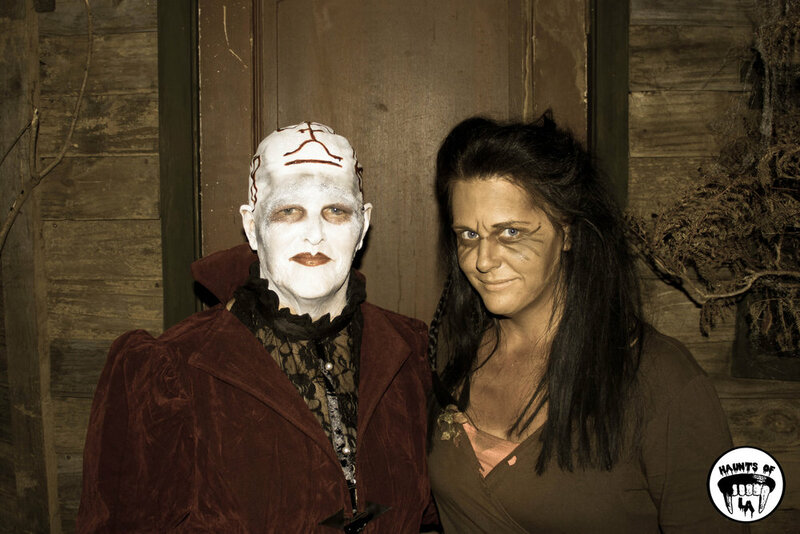 One of our Halloween traditions is to make the trek out to Apple Valley and visit All Saints Lunatic Asylum, a one of a kind maze built by a family deep in the high desert. For the past few years, this attraction has been built in a rented storefront, providing a highly creative and exciting experience that gives places like Haunted Hayride a run for their money. The art direction and the performers in this maze are so well developed that you feel like you are experiencing an interactive play. Their maniacal characters are incredibly talented improvisers who easily mold their performances according to how people are trying to escape the asylum. All Saints Lunatic Asylum has been around for a while, and we have noticed the development of embellishments throughout the years. Their cemetery is now complete with real coffins from a funeral home, and they have stars that twinkle in the ceiling to make it look like the night sky. All Saints Lunatic Asylum is endlessly fascinating, and like their neighbor at the Victoria Manor, is one of our favorite haunts of the season. We have had the pleasure of attending Jordan’s High Desert Haunt, aka Victoria Manor, for the past 3 years. This haunt is a hidden gem which can only be accessed by driving up an unlit dirt road in the middle of Apple Valley. Victoria Manor is a ramshackle paradise built with pieces of old houses, vehicles, and stacked up rubble. It’s an astonishing and spectacular haunt that is always a priority for us to visit. The Victoria Manor feels at times scary, funny, or ridiculous. It hosts two mazes which are drastically different – the first maze is mellow, and the second maze is completely insane. The second maze is overwhelmingly beautiful and chaotic – there’s fire, chainsaws, and numerous moments where practically every character of the maze is following you. Characters range from young children to older adults. Our favorite character is the one armed Frankenstein monster. This man constantly pops up in front of you, always in the same pose with his arm out while never speaking a word. The Victoria Manor has its own unique personality unlike any other haunt we’ve visited. As enormous fans of this haunt we encourage everyone to visit this weekend. Tonight will be 18 and up night and the weekend is going to have a hayride in addition to the 2 mazes. For decades, Rotten Apple 907 has been one of the most inspired haunts in the SoCal area. Every season they completely change their theme, constantly evolving to the delight and surprise of their visitors. Two months ago their storage flooded, destroying many of their flats. To make things worse, the presence of multiple bee hives caused even greater damage. The family tried to salvage as much as they could, and worked tirelessly to get their haunt open in time for Halloween season. This year’s theme is "The Portal". Its tone is very dark, especially compared to the usually playful nature of their past haunts. In previous years we have seen themes ranging from cowboys to fairytales. This year, the maze is more bare bones, with a beautiful focus on dark characters, colors, and lighting. As you travel through the maze you will hear the haunting sound of bees buzzing through the walls. Within the rooms you will see shadowy witches and skeletal remains which startle you as they suddenly come to life. As expected, everything is very imaginative and executed with precision with timed electronics and original theatrics. Despite the unfortunate circumstances with their storage, the Rotten Apple family pulled together another spectacular and flawless haunt. Rotten Apple 907 is in a league of its own, and "The Portal" shows that even in their darkest moments they can bring joy and wonder to people of all ages while raising money for charitable causes. You might have read our review last month for Bob Baker's incredible Halloween Marionette show. It is such a beautiful performance to celebrate the season and the world that Baker helped pioneer. That said, it was quite a surprise this past Sunday evening when the theater group pulled up to perform for the people waiting in line at the Ghost Train. They played an abbreviated version of their seasonal show to the delight of adults and children alike. They livened up the otherwise (worthwhile) long wait much to the appreciation of everyone who got to witness this very special moment. Rumor has it performances will be popping up unannounced for the rest of this season. The Live Steamers, who host Ghost Train, and Bakers theater group are both historical legends of LA entertainment. Please get out and support both this weekend before Halloween season is finished! In the Pomona Fairplex lies the most surprising haunt of the season: Into the Black. This maze and VR experience is created by Bone Yard Effects - the genius minds that have been the best part of Universal’s Halloween Horror Nights. Being seasoned fx and set design masters, they are likely responsible for all of your favorite sights from Horror Nights of the past decade. Into the Black is an original creation and is based on their film of the same title. The multiple scaractors, like characters in the film, have the most beautifully detailed costumes, prosthetics, and makeup. Each performer has been individually fitted for its own unique character, so that what is worn has been perfectly matched to their body. This great attention to detail, along with demonic vocalizations which form a common language, create an immersive and otherworldly experience. You feel like you are stepping foot inside of a Clive Barker film. Like Barker’s universe, Bone Yard Effects has created a world with such a refined aesthetic that you can FEEL the world that they take you through. In the maze you travel alone and therefore have a lot of time with each character. Being isolated means that you have to constantly look behind you because there will be performers lurking in the shadows. I’m sure that its creators saw how the customer experience at places like Horror Nights suffered due to gigantic crowds and a lack of intimacy. Into the Black’s approach gives you time to soak in the beautiful details and plot that otherwise would be easily missed. The passion and detail Bone Yard put into every room is incredible and captivating. Before the haunt, you get to enjoy a virtual reality short film. While I usually roll my eyes when people try to incorporate VR into anything - this one was done just right. The film contains a great plot in which the VR is perfectly utilized. With a bigger budget I can see this film expanding into 4D shows like what is seen at Disney’s El Capitan Theatre. Into The Black is an idea fully realized and perfectly executed. Bone Yard Effects dedicated a great amount of work and time to making their world completely immersive. Their success is a result of both their professional background and innate magical abilities. This incredible show is only running for 6 more nights. Make a trip to Pomona and don't miss out on this incredible experience. You would never guess that deep within the shopping complex of a Janss Marketplace, in Thousand Oaks, there sits one of the largest and most complex haunts in SoCal: Reign of Terror. This labyrinthian haunt contains 100 rooms, and has resided above a Gold’s Gym for almost two decades. Hosting some of the greatest frights you will ever experience, Reign of Terror is meticulously detailed with precisely delivered effects ranging from creeping fog, to sudden flashes of lighting, to bloodcurdling screams. During your journey through the rooms, your group will be kept together as they actively break up groups who catch up with others. This is a unique tactic which is used to enhance your experience without being disruptive. There are many, many themes throughout maze. Each is seamlessly connected to the next as multiple horror-filled dimensions unfold in front of your eyes. Reign Of Terror is a must for anyone looking to experience one of the most legendary haunts of California. Rumor has it the Los Angeles Live Steamers had a lot of drama within their group last year which resulted in some members vandalizing the Ghost Train props. As word spread we heard there was a chance that the Ghost Train was never coming back. In August we spoke to a member who said they had no plans to do it this year, but then at the last minute they announced its return! The Ghost Train is back and we are SO HAPPY to have this one of a kind experience around again. This is the only Halloween attraction in the world where you can ride a mini train through various Halloween themed sets while surrounded by historical artifacts (including founding member Walt Disney’s backyard barn). As expected the decor is a welcomed sensory overload. There are lights, flames, and robotics everywhere. The greatest hits of past Halloweens are still present: the outhouse skeleton, the grumpy yelling tree, and the demented evil Teddy Bear. The newly added pyrotechnics and projected spooky images elevate this train experience to a new level. We welcome the Ghost Train back in its full glory. A true Halloween attraction for people of all ages to enjoy. We encourage everyone to go and partake in this one of a kind experience. Remember to queue up early because the lines have been very long. 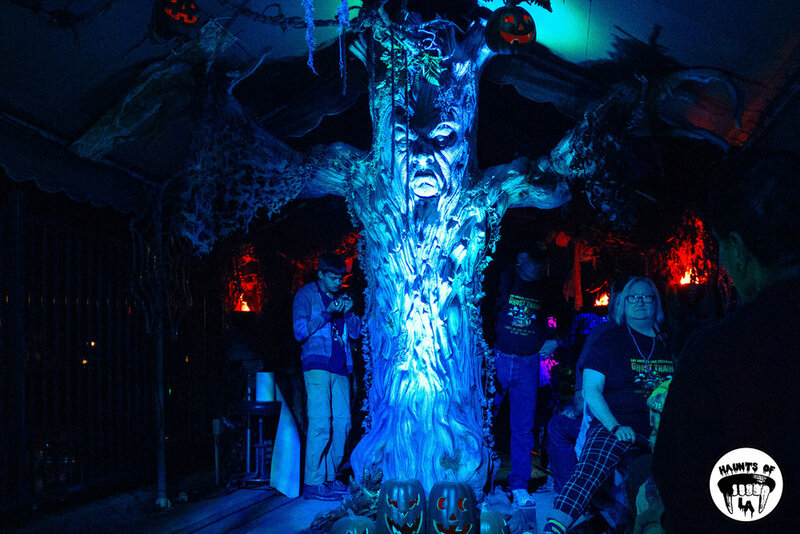 Burbank during Halloween is home to two of the best mazes: Rotten Apple and Backwoods. For years they have outshined all of their counterparts, including mazes with major funding (Universal Studios and Haunted Hayride). The attention to detail, plot and creativity of Backwoods immerses you into a completely transformative experience. This maze has been meticulously created in someone’s back yard. It has evolved throughout the years into what it is now: a sci-fi themed armageddon in which interspecies hybrids are the only ones left to party. The breathtaking art direction has been maintained through years of inspiration and imagination. You will be taken into different levels and though multiple bizarre environments which are custom built, creating a sense of wonder and amazement at every turn as you behold the chaos which awaits you. You will be sure to encounter many of their original characters, including the most notable personality - Rocco Rhinotelli, a human/rhino hybrid. Backwoods is the pinnacle of SoCal Halloween mazes. The world that they have created is so special and unique and deserves to be in the top list of haunts for fans far and wide. Maze maestro Scott Sivley has been building yard haunts in southern California since the 1970s. His latest haunt, Beware of the Dark Realm, has been running every halloween season since 2013. This is a free haunt, however a $5 donation will get you to the front of the line, and you will be donating to Sivley’s fundraising efforts on behalf of the local non profit SCV Domestic Violence Center. Sivley’s fundraising is a beautiful endeavour which makes an already incredible haunt experience that much better. Beware of the Dark Realm is located in a neighborhood which is as suburban as it gets. Every year the maze is surrounded by multiple open garages where families are playing foosball or karaokeing together. It’s a surreal contrast to Sivley’s yard which has been replaced by a hand built medieval castle extending all the way to the sidewalk. This haunt is creative, scary and fun. It is the artistic culmination of decades of experience in building haunt mazes. The reveals, paths, and art direction are laid out perfectly: around every corner you will experience a new demonic encounter along with medieval characters and miniature sets. The flow of this maze is seamless, and the time spent wandering its ghoulish corridors feels much longer than the time and space of a modest front yard. Beyond the Dark Realm is well worth the drive to Santa Clarita. You can donate to a worthy cause while enjoying one of the most unique and creative haunts in southern California. While you are there, I encourage you to thank all of the wonderful volunteers for their labor of love which can be enjoyed by people of all ages. Fallen Saints isn’t a maze, but rather an interactive horror theater pulling influences from Day of the Dead and Mexican folklore like La Llorona. The actors are skilled at their work and present a very intense story. Fallen Saints is set in a very minimal environment, with a few shows per night. There is limited attendance allowed for these shows due the intimate nature of the performance. The play ended with an exit which was very climactic and satisfying. Fallen Saints is located near Backwoods and Rotten Apple, which makes it a great addition to cap off a haunt night in Burbank. We came across a hidden gem in Toluca Lake: a maze tucked behind a pumpkin patch. This was a random find because I happened to see a hand painted sign during my drive between Backwoods and Urban Death. The sign simply stated: “petting zoo! maze!” Curiosity got the best of me, so I got my $6 ticket and queued up. The maze itself is decorated with numerous dummies and robotics. Junk litters the floor and covers the walls while sounds are being played from mysterious places. There are moments where I couldn’t even tell if the animatronics were people or not. There is one lone scaractor, played by the creator who owns the flower shop next door. I won’t spoil his appearance for you as it happens unexpectedly and serves as the only scare factor within the maze. This is a special haunt unlike any others I have been to. It has elements of carnival sideshows, horror and straight-up weirdness. My only complaint is that I wish it were longer and had a name. Totally worth a visit! The setting tonight was what you would expect to come across in suburban LA: empty parking lots, one-story offices, and nondescript storefronts. Nestled by the freeway, there is a modest looking convention center. Though you would never guess it from looking at the outside, what has been built within the walls of this building is one of the most impressive and unique haunts in southern California: Mable's 6 Feet Under. The creators of Mable’s 6 Feet Under are a family who grew up in traveling carnivals. This haunt wears this influence well. It's black lit and fun but frightening set's come across as Pee Wee's Playhouse meets the giant arachnid's of classic sci-fi films like Taranchula. The timing and organization of this maze this is impeccable. Around every corner - something strange awaits you. Whether it’s an animatronic encounter, or a changing maze path, it’s hard to separate the imaginary from reality. With every turn there is a natural pacing within the maze that remains unrivaled. MABLE’S 6 Feet Under is the embodiment of the spirit of Disneyland with the twist of sideshow carnivals. The character and passion put into this maze is pure, and no stone has been left unturned in its execution. If you want an exceptional haunt experience, then MABLE’S 6 Feet Under is for you! Before the ship’s retirement in 1967, the Queen Mary was the site of 49 deaths. After settling in its forever home of Long Beach, the Queen Mary has become a famous site for recording ghost sightings. Taking this information into consideration, this has to be one of the best places in the world to set up a series of haunted mazes. Queen Mary’s 2017 Halloween season, Dark Harbor, had an impressive opening last week. First, it was a delight to discover that they updated the production of the mazes on the boat. The classic mazes “Lullaby”, “B340” and “Soulmate” are now re-routed through new areas while a new fourth haunt, the twisted WWII culinary maze: “Feast”, was added into an area of the ship I'd never seen before. These improvements that Dark Harbor’s production team are doing- expanding the ship’s haunts to reveal perspectives of the boat missing from previous years- are welcomed. Unlike Halloween Horror Nights they don’t seem creatively stuck and are willing to keep things fresh. The land mazes, "Deadrise" and "Circus", have both been relocated. In the past I usually didn’t enjoy these as much as the ones located on the boat. However great improvements have been made with their set and characters. For example Circus now has an improved "white room" and a hidden bar. These are now feeling on par with the ship maze so much that I didn’t even miss the dome being a part of the park. The “Intrepid” maze has been moved to the North Pole village area of the park. It's a relief seeing them incorporate this building again as it has always been one of the best areas in the park for a maze. Additionally the steampunk theme of last year’s maze is long gone, and instead it is highlighted by a simple and creative laser smoke room that is hidden among the swamp themed ruins. Dark Harbor is creative, historic and fun - making it one of the best haunts in the southern California area. We highly recommend you make it out to experience it if you have the time (and purchasing front of line is highly suggested). Lastly, the park has been purchased by the developer Urban Commons who are proposing to turn the entire park into a run-of-the-mill mini-mall. To most people, the true power of this ship is that it transports you to a different time and space. A mall would ruin that, so let’s hope the developers are very careful about what they do to this sacred space. 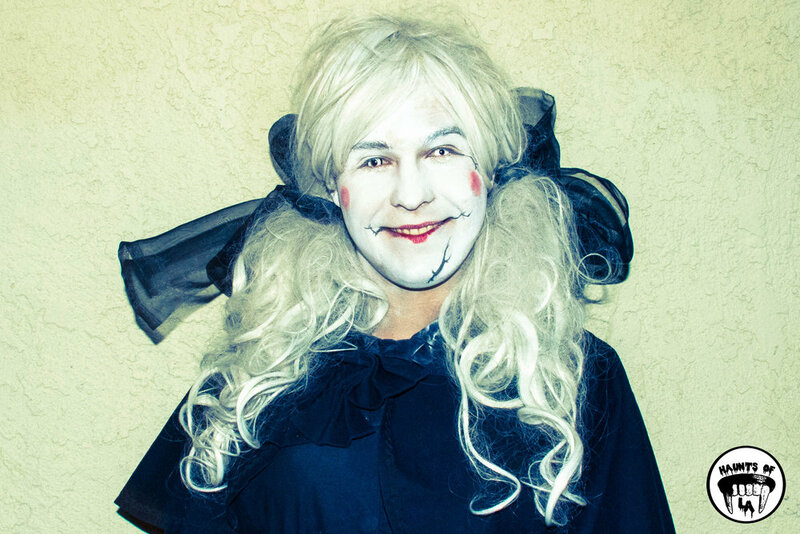 REVIEW: BOB BAKER'S MARIONETTE THEATERS "HALLOWEEN SPOOKTACULAR"
Change has been happening in LA. The foreign investors are here and everything that is part of the community is threatened: homes, landmarks and neighborhoods… even Bob Baker’s beloved marionette theater in Historic Filipinotown. While the following review isn't for a maze it will be for an incredible one of a kind Halloween performance. As we walked inside the theater and sat beneath the red velvet curtains and dusty stage lights we couldn't help but feel like we were transported back in time to a classic era of American entertainment. This setting is absolutely perfect to see Baker’s hand made marionettes which are performed by extremely talented puppeteers. The Halloween show itself is very special. There are some very creepy children trick or treating that flow in and out of the show. Ghosts and witches come out and fly around to the joy of the crowd. We especially loved the blacklight Day Of The Dead tribute which was midshow. It’s very sad that the developers who bought the theater's building don’t understand that this space is more important than any profit. The Bob Baker Marionette Theater is a historic, one of a kind institution that has deep roots in Los Angeles. This place should never change. It’s perfect the way it is and should be supported so that it can remain alive and well for the benefit and entertainment of people of all ages.